We walked down the streets of Jaipur during the partly-cloudy and partly sunny afternoons last weekend. Our photographer Vinod Singh Gusain carrying his (heavy) high-end camera lens while we, with a pen and diary, strolled many narrow streets of the city to hunt down the addresses of 5 women who were going to be a part of our Women’s Day campaign – Aid To Maid. 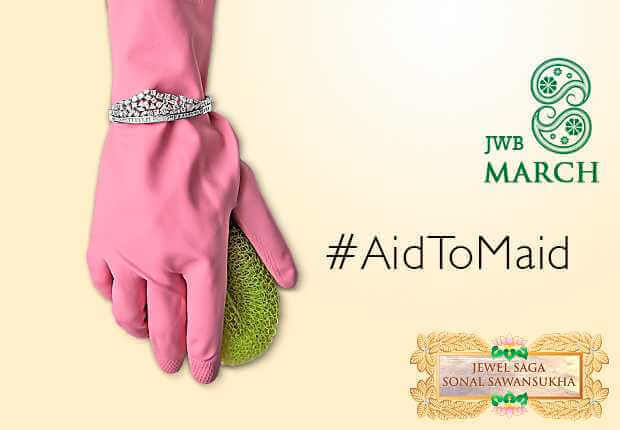 The campaign is in association with the city based talented Jewellery Designer Sonal Sawansukha’s brand Jewel Saga. 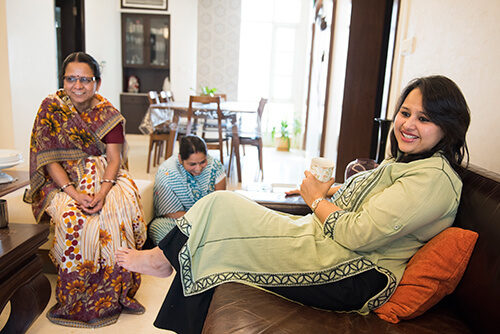 This March 8th Sonal thought of empowering the maids who work at our home and workplace. After a small tête-à-tête, we decided to support her wonderful cause. We fixed meeting with few Jaipur women along with their respective maid to know how they are making the latter’s life powerful. Basking in the morning sun, we began the campaign with Director Apex Hospital Sheenu Jhawar and her 2 maids. 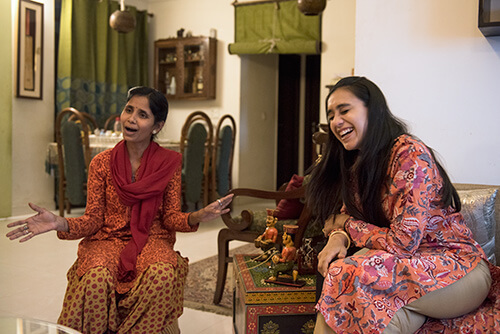 Apart from discussing some valuable saving plans with her maids like PF account, self-insurance, etc; Sheenu impressed us with her one more quality. Apart from being a brilliant master, she has some great parenting tips to share. Her home has no television but many books in every room. This decision was made for her son who goes to school and was very fond of TV. Today, just like his mother, he loves to dig his nose in books. However, we’re thinking about the guests who stay at her place! Next we went to Chairperson Ficci Flo Jaipur Chapter Apra Kuchhal’s home during lunch time (and why not she owes an awesome restaurant!). Her maid is well educated and can easily grab a back-office job but why is she still working as a maid? She says: ‘I love working with Apra bhabhi. She has taught me to stay strong and smile when things went wrong at my home’. But looking at their laughters, they looked more like friends. How lovely. 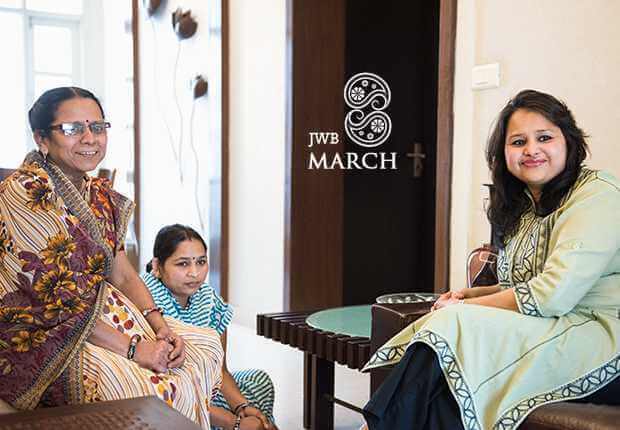 We forced the Jewellery Entrepreneur Sonal Sawansukha herself to be a part of the campaign. After a long nagging, she agreed and invited us home to meet her 6 months old baby girl’s caretaker. 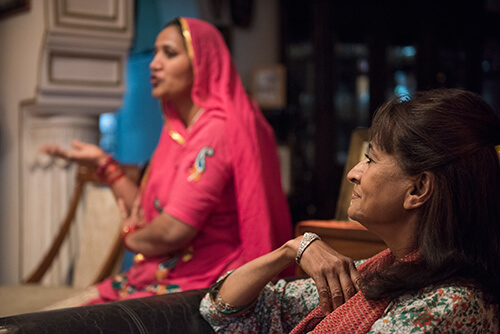 Sonal told us how much she loves her Nepali maid and is afraid to let her go. ‘I don’t even talk about her retirement plan, I am scared. My baby is very comfortable with her and that’s how I can give my 100% to work,’ says Sonal. And that’s how you design some brilliant pieces, Sonal. 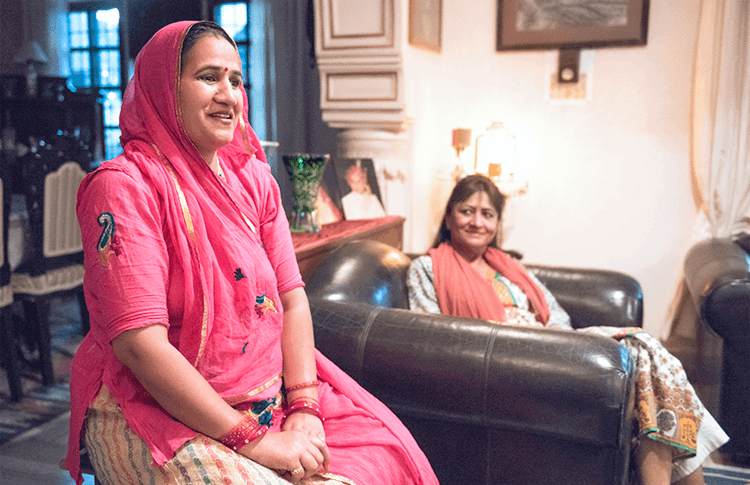 By the time it was evening and cool breeze started to make Jaipur a merrier place, we rang the doorbell of Sportsperson and Social Activist Asha Bhatnagar. Apart from getting smitten by her personality, we also learned a thing about womanhood from her – how to be humble with every person around you irrespective of the class. Wait for her story; you’re going to love her! And at last we met the celebrity Fashion Designer Pallavi Jaipur at her workshop. 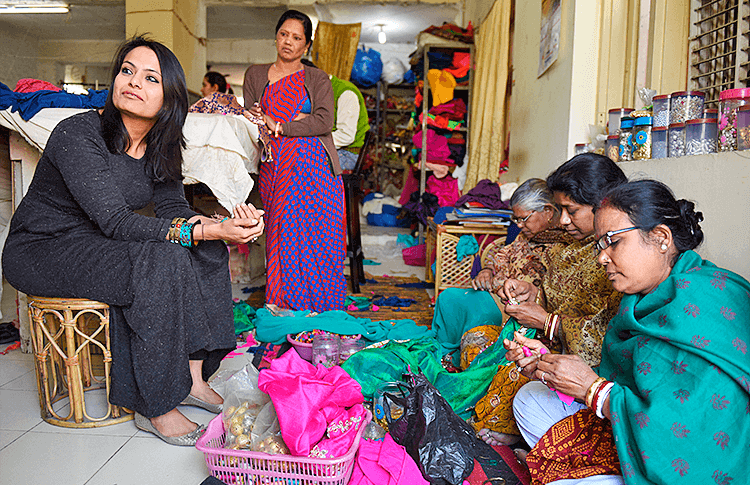 Sitting on the ground with her 50-something women artisans, Pallavi was nothing close to ‘celeb-tantrums’. Her female staff loves her like their own daughter and this was proved when one of them said: ‘My husband who also works here had a fight with me the other night because I prepared a special Bengali dish for Pallavi mam and not offered it to him during lunch break’. Aww. Aren’t you excited to read these 5 stories of #AidToMaid? We are soon coming up with the 1st story. Keep an eye to learn how to empower your maid at home!